Towering clouds over the towering mountains surrounding Lake Garda made conditions challenging for competitors and race management on the opening day of this inaugural GC32 World Championship. to southerly Ora, two races were held in full foiling conditions before the wind finally dropped and the competition was abandoned for the day. Ernesto Bertarelli and his crew on Alinghi, present leader of the Extreme Sailing Series™, made easy meat of the first race, starting by the pin and hitting the left side hard. 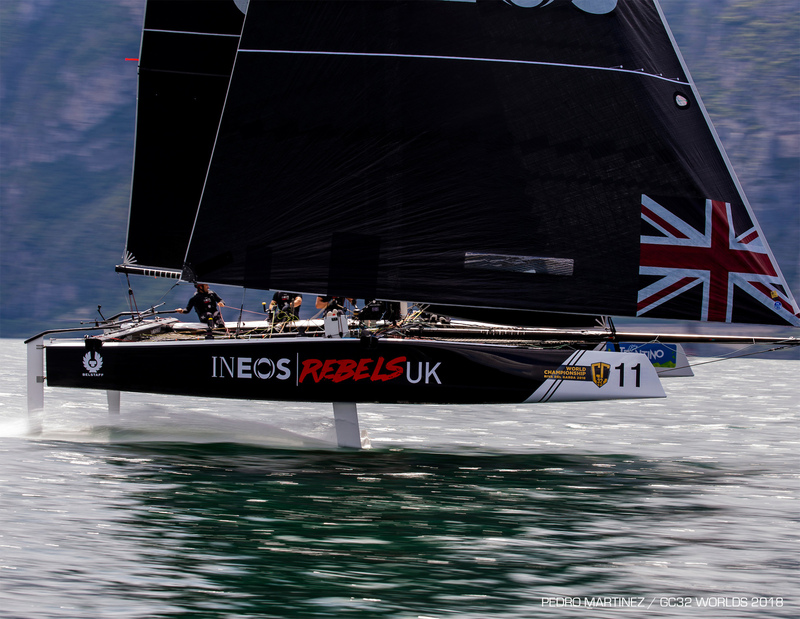 Yet their Swiss rivals on Jérôme Clerc-skippered Realteam, winner of last year’s GC32 Racing Tour, spent most of the first beat playing the right and when they converged with their compatriots were not far behind. Alinghi extended on the run to win by 22 seconds (according to the SAP sailing analytics) from the Realteam. However after their outstanding debuts, Alinghi and Realteam were a little too enthusiastic starting race two: Both were called OCS, leaving them fourth and eighth overall respectively at the end of day one. Of their mixed results today, Realteam’s skipper Jérôme Clerc said: “We know we have speed and can do manoeuvres. You just have to try and make less mistakes than the rest.” Realteam won here at the GC32 Riva Cup, opening event of last year’s GC32 Racing Tour. If Alinghi dominated the first race, then emulating this in race two was INEOS Rebels UK, helmed by seasoned multiple Extreme Sailing Series winner Leigh McMillan. In fact they won the race by an even larger margin, coming home 37 seconds ahead of the Phil Robertson-skippered Oman Air. Skipper of the British crew (who, apart from McMillan, are all aged 22-3), Will Alloway described their races: “In the first, we had a good first beat and then picked the wrong shift downwind and sailed out of the pressure. When we got to the leeward gate, we didn’t make the right choice and we dropped to the back of the fleet. Carroll is also leading the GC32 Worlds’ Owner-Driver Championship, although on countback from Simon Hull’s Frank Racing, the Kiwi team making a valiant start in their first ever regatta with the European GC32 fleet. Having only sailed two races today, PRO Stuart Childerley has chosen to move the start of racing forward to 1230 CEST tomorrow.